You will never die. Beyond the mortal boundaries of your physical form, you are an immortal being, living forever in a beauteous, radiant body of luminous spheres in multiple dimensions. Ascension: Connecting With the Immortal Masters and Beings of Light will open your eyes to these spheres. You will begin to awaken your true, immortal self-a magnificent being of brilliant light, radiance, and glory. * How to meet the ascended masters and angels of light. * Stories, beautiful paintings, and drawings of these immortal beings. 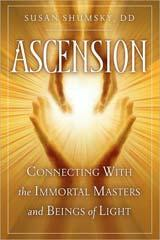 * What it means to experience ascension and walk beyond death. * Stories about visitations from divine beings. * People living today who might be ascended masters. * Inspiring messages from the immortal masters and deities.